The Sand Drying House is fairly small, only 10’-6 wide X 12’-3 deep. It is a really simple 1-2 evening build that just about anyone can handle. Great for first timers. For such a small building, it has a lot of detail. Of course you don’t have to use it as a sand house. It could fit in anywhere on the layout as just about any kind of shed. The Philly Modular Flat is a unique departure from our regular kits. construct buildings as small as 1 bay x 1 bay x 1 story to just about any size you wish. You just keep printing and adding more pieces. Your imagination is the only limit. You will have to do more planning and fabrication than usual, but that is the fun of this kit. Two examples of what can be built are shown, but the possibilities are endless. 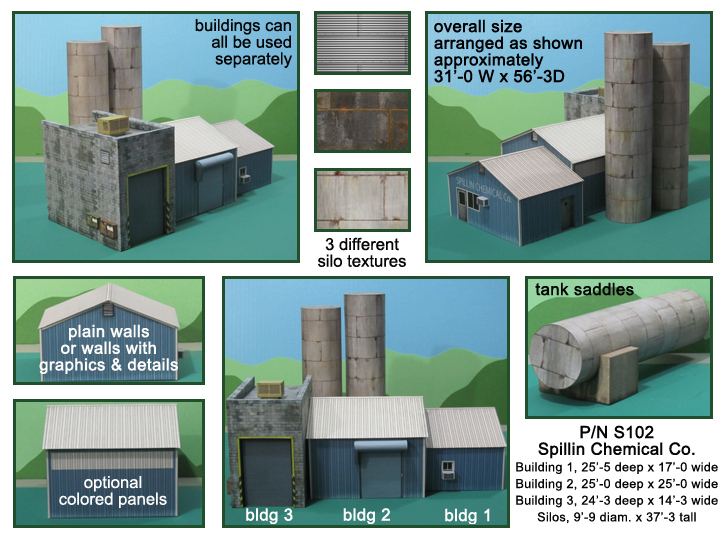 P/N S102, Spillin Chemical Co.
Spillin Chemical Co. is a very versatile kit for the modern modeler. or independently scattered around the layout. Different wall, door & graphic options are included. 3 different types of vertical silos or horizontal tanks can be built. Optional concrete tank saddles are provided. Also, the wall textures used in the kit are included so you can kit bash easily. There is a lot to this kit, but an average modeler can build it as shown, is about a week of evenings. The Modern Office Trailer is something that I think everyone has seen at one time of another. They are used on just about every construction site and come in many configurations and colors. This kit, while being nicely detailed, is fairly easy for beginners and veterans alike. You will use many of the basic skills needed to build a high quality paper kit. Parts are provided to build the trailer in 3 colors. This is a most satisfying kit and goes together in less than a week of evenings.